If you like this site, please consider a donation. Thank you! 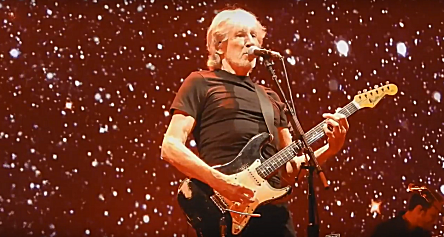 During the Us and Them tour (2017-2018) Roger Waters used a never-seen-before Fender Stratocaster with a black worn-out body, rosewood fingerbord, and small headstock. This guitar was borrowed from Gus Seyfert, the guitarist who toured with Roger and had worked on his Is This The Life We Really Want album. The Gus' Strat was played in Welcome to the Machine. Powered by Thingamablog 1.5.1 - Design by Andreas Viklund - Ported by Ainslie Johnson.